One of Masaccio's most famous paintings, "Tribute Money," not only demonstrates the linear perspective and chiaroscuro techniques which are present in Trinity, but also the choice of colors and his depiction of three dimensional characters in three different settings, was a revelation in painting. Masaccio uses an old narrative format by showing three consecutive events in the one painting. This technique being abandoned for hundreds of years during the Dark Ages was probably picked by Masaccio when he went to Rome to study classicism. Although one normally reads from left to right, the first image is presented in the middle of the painting. The vanishing-point on Christ's forehead makes sure our eyes go there first. From there Jesus and Peter are pointing to the left where then Peter goes and picks the coins from the fish's mouth. Lastly we move to the right hand side of the painting where Peter pays the tax collector. The use of this type of narrative moves away from a symbolic portrayal of Christ as the Gothic artists would have him presented. The narrative instead reverts back to classicism and logic. This painting is very different from the ones before it. 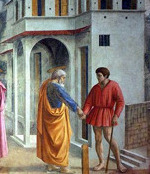 With the use of the linear perspective technique Masaccio can further develop some elements in the painting. The casting of shadows behind the characters to the left is remarkable and the amount detail on the characters' feet. Light seems to alternate and change throughout the painting. The amount of detail on each of the men's faces adds a stark realism to the painting and the shadowing on the clothes and drapery is done so well the painting seems devoid of any lines. There are three main aspects to this painting that give us depth and a three-dimensional painting. Firstly, the landscape in the background and Peter by the river extracting the coin are painted farther back into the painting than the other two scenes and are almost void of color. Secondly, the buildings on the right, although not present in the story from the bible, serve to provide classical structure that pushes light towards the center of the painting. The lines and the center of the structure are clearly aimed at Christ's head where all the light converges. It is interesting to note that while the halos are indeed tipped to one side, to show them as real physical objects, that they are even in the painting at all. Some suggest because of Masaccio's talent and his ability to portray characters so life like in his paintings, he needed something to mark them as religious figures and felt obligated to put something in the painting to designate them as such. The semi-circle around Jesus is probably a mathematical tribute to the wisdom of God. Jesus is depicted in the center of his disciples and the use of the semi-circle, although a classical pagan tradition could be intended to show the perfect grace of the divine. This painting is not the first time Masaccio had used linear perspective, but it has been his best to incorporate not only the technique but also his preferred uses or likes, detail and shapes that we see lacking in his "Trinity."